I read about motherhood a lot. Not just because its relevant to me, but because I find modern motherhood to be particular enthralling. Never before have we had so many choices as mothers - breastfeeding vs. formula, to vaccinate or not, stay at home vs. working mother, exposing our children to technology. And these choices are continually hyped by the media. We're suppose to lean-in, cry it out, find balance, and put a tidy little label on it. The last 60 days of my own adventure in motherhood has been challenging. I left full time work in preparation for baby number two, but also to find a better work/life ratio. I won't call it a work/life balance, because 'balance' is a beautiful, mythical unicorn. Anyway, I thought that being a full time mom and wife might be better for our family. The first week I was so gun-ho: making a cleaning schedule, committing to a summer reading program, trips to the library, the park, and potty training (!!!). Basically I was a SUPER MOM. I was also really miserable. I found my threshold for pleasant homemaking, creative toddler activities, and reading Fancy Nancy with enthusiasm is about 4 days. A creative person, like myself, with no outlet can be kind of ugly. I spent a lot of time and money on finding curtains, of all things, and maybe I irrationally cried about laundry once. Luckily my husband is incredibly supportive (or terrified of me) - so I started taking freelance work. Recipe development, food styling, and a little project management for good measure. The pendulum quickly swung the other way and I was busier with work than I had been with a full time job and I was still trying to do the SUPER MOM thing. It was silly. The struggle, my struggle, was I felt like I needed to be something - if I wasn't a "working mom" then I had to be "stay-at-home mom", right? When I reach these questions I ask myself - "What would I want my daughter to believe"? And I realized something so stupidly simple, something that should be so apparent already (and maybe it is to everyone but me?!) If Ella wants to be a mom, start a family, have a career, become a CEO - I want her to know - she doesn't have to label it. She doesn't have to put her head before her heart just to fit into a tidy little box. She doesn't have to choose between being a homemaker or being a boss. I'm still finding clarity on what I am now - I'm still working (at home and sometimes not) but I don't check into a desk each day, and I have the flexibility of taking Ella on a donut picnic anytime I want to. Ella will continue to go to preschool 3 days a week, because I now understand what I need my work/life ratio to be - even if I don't know how to label it. Our challenge as modern mothers will be stepping away from clean profile labels and the ever-widening exposure of motherhood to understand ourselves without comparison. We will be stronger mothers without comparison or labels when we can each tell our own stories in real conversations (hopefully over lots of wine). 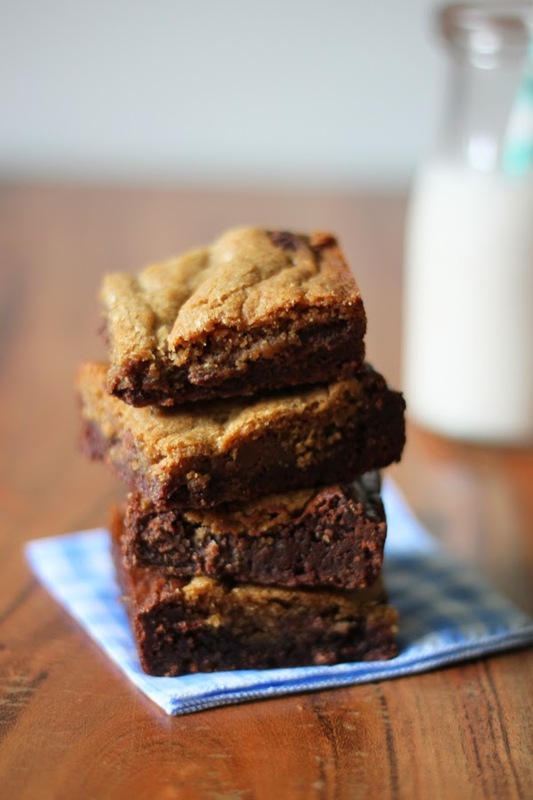 These blondies meets brownie bar mash ups are much less about 'not having to choose' than they are about my procrastination, because I would, of course, feel inspired to bake and write a blog post when the thing I need to be doing is packing my daughter and I up for a ten-day trip. I may take a few of these as gifts of thanks, bribery, or apology for our fellow travelers. Two and 3/4 years old is a very emotionally erratic time, so it either going to be smooth sailing or a complete disaster! Wish us luck. 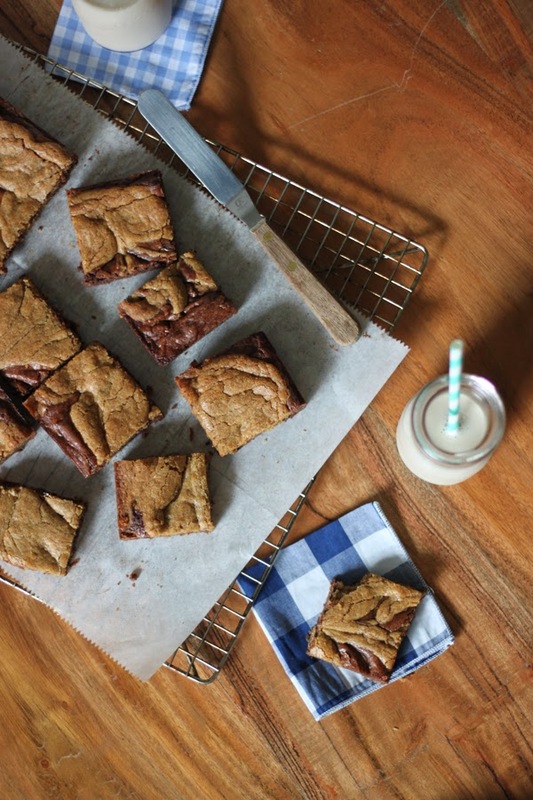 This bars are inspired by Dorie Greenspan's Chipster bar, which is basically a brownie with a chocolate chip cookie baked on top. 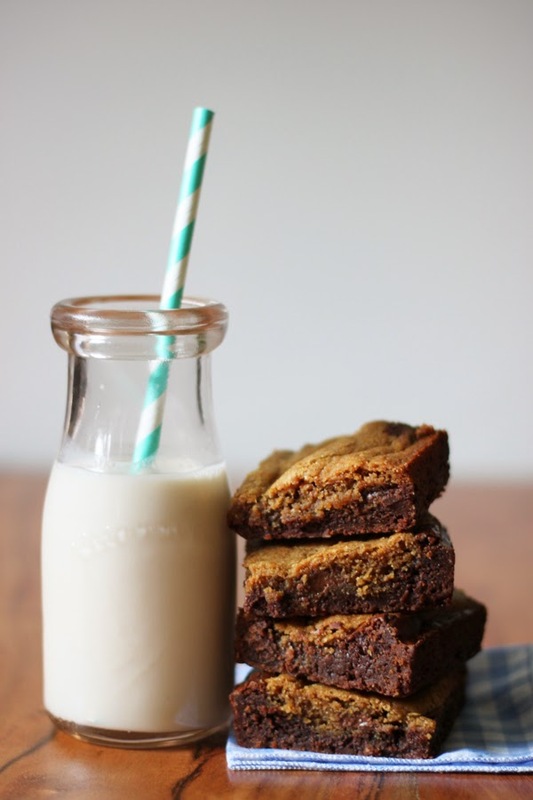 I was feeling too pressed for time to make a batch of cookies and blondies are always the perfect solution for that! These are rich and sweet, loaded with chocolate and you are absolutely going to need a glass of milk or a strong coffee on the side! Heat the oven to 350 degrees F. Grease a 9x13 baking pan and line with parchment paper. 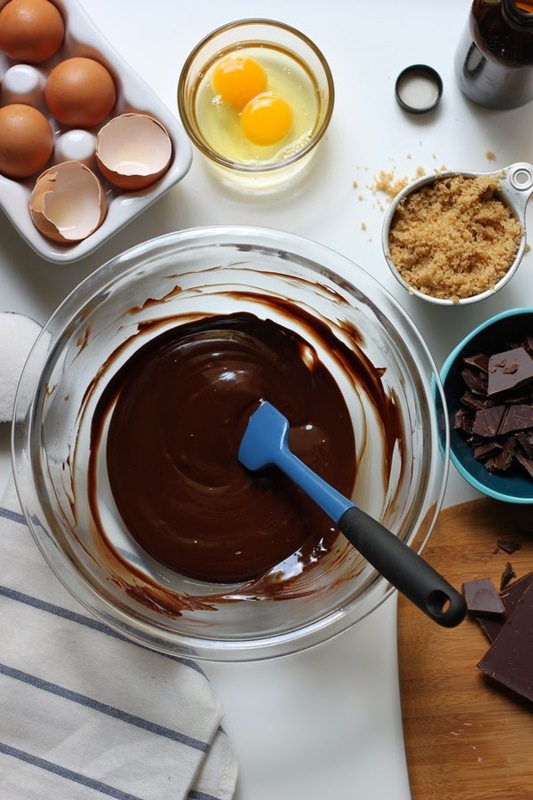 Melt the chocolate and butter together in a large microwave safe bowl using 30 second intervals in the microwave, stirring between each. This should take about a minute and a half. You can also melt the chocolate and butter over a double boiler. Beat in the sugars. Add the eggs one at a time and beat until smooth. 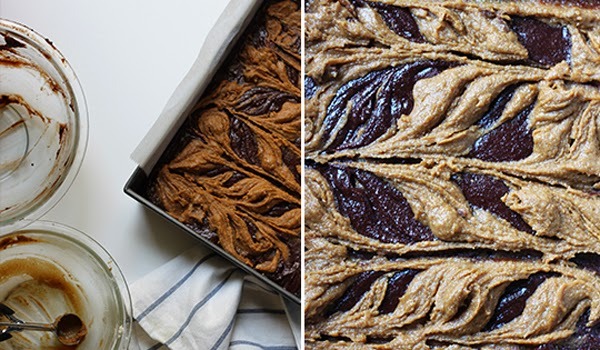 Fold in the flour, salt, and additional chopped chocolate and pour into the prepared pan. Melt the remaining butter in another microwave safe bowl on high in the microwave for about 30 seconds. Beat in the brown sugar, followed by the egg, flour, baking powder and salt. Fold in the chopped chocolate. The blondie batter will be slightly thicker than the brownie batter, so I like to scoop the blondie batter in 2 tablespoon scoop over the brownie batter and then swirl with the spoon to incorporate. Bake for 30 to 35 minutes or until a knife inserted into the center of the pan comes out mostly clean. Cool for about 30 minutes in the pan before removing a slicing. Wow these look so yummy! I'll have to try them out this weekend! Thanks for the great recipe suggestion! Found you through SBS! These sound incredible. Thank you for the recipe! And you know, you nailed it on the head! I kind of just want to live face to face with God and no one else. And if my children can see that I love them more than anything in this world, than that is all that matters to me....whether I am working or not. Ella is lucky to have such a wise a mama! Thinking of you in this time of adjustment! I just started a blog (www.pawprintsinchattanooga.com) and I hope I can write such great post someday.